Two off leash dog loops have been developed on the mesa areas just south of the main entrance to Red Rock Canyon Open Space. The total length of the loops is approximately 5/8 mile. On other trails in Red Rock Canyon Open Space, pets must be on a leash at all times. 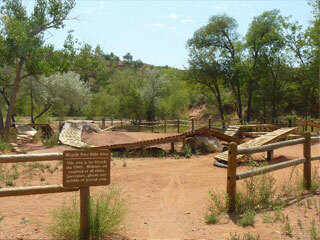 A family picnic area in the lower part of Red Rock Canyon includes wheelchair accessible picnic sites. A group picnic area is currently planned for the lower part of Sand Canyon, and may be developed in the future. The bicycle freeride practice area in Red Rock Canyon will be developed in 3 phases. Phase 1, the beginner area, is now scheduled to open in early January 2007. While this is a little later than we expected, we agree with the suggestions made by the city Parks Department in a recent walk through and will implement them before the official opening. One focus in phase 1 was to provide an area for skills development in a safe environment. We tried to include several levels of “beginner” stunts that will allow users to progress to more difficult stunts as their skills improve. You can see this progression in the various sizes of teeter totters, drops, and bridges (or “skinny’s”). It would be impossible to completely eliminate all hazards in a park of this nature, but we have done our best to reduce the risk of needless injury through the location, type, and landscaping around our stunts. An important part of safe freeriding is confidence – you are more likely to make a mistake if you hesitate in the middle of a stunt. We hoped to help riders improve their confidence by including some technically challenging stunts very close to the ground. As an example, one of the most difficult stunts in phase 1 is a 4×4 board buried in the ground. If you fall off, the consequences are very low – yet most riders won’t be able to complete this stunt on their first attempt. Although its location at the entrance of the park puts the skills area directly in the public eye, we are mindful of the need to manage our ecological impact on the space we share. We try to incorporate natural features of the landscape when possible, and consider our effect on vegetation in our area. We are also cognizant of the desire to reduce the visual impact of the park. As we continue with phases 2 and 3 (up the hill from phase 1) we will work with Parks and Recreation to keep our new stunts hidden when possible from the picnic and hiking areas below. This construction will take place beginning in the spring of 2007. More complex stunts including swinging bridges, rotating teeter totters and challenging rollers will be further stretch the riding skills of our more experienced park visitors. We will incorporate suggestions from world class freeriders, as we proceed with building phases 2 and 3. All areas will be marked and fenced to prevent someone from accidentally finding themselves in terrain more difficult than they intended. We will also have a rules and regulations board at the entrance to the park, along with a sponsor board to recognize some of the organizations that helped to make the skills area a reality.